The NuWu Cannabis Marketplace is owned by the Paiute tribe here in Clark County and is the largest of all of the Las Vegas dispensaries, and in fact it is the largest marijuana dispensary in the world. 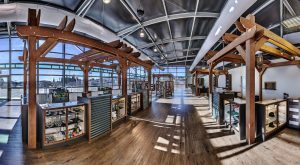 The 15,800 square foot marketplace offers both medical and recreational cannabis and serves more than 1,000 people per day. They recently signed a media contract with the Las Vegas Lights, an expansion team in the United Soccer League, to have a cannabis advertisement at Cashman Field here in Clark County. 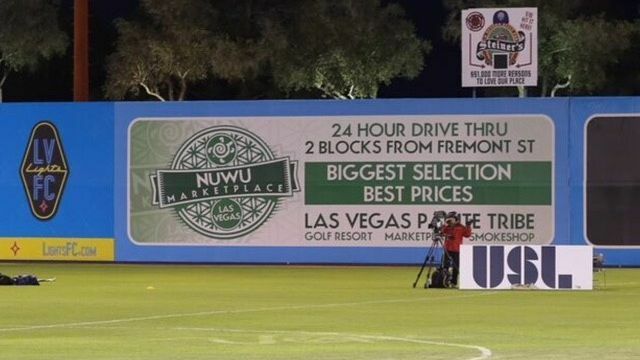 The ad simply let’s viewers know where the NuWu Cannabis Marketplace is located, that they have a golf resort, a smokeshop with the largest selection and best prices and a 24-hour drive-thru, and that it is part of the Paiute tribe. Nowhere on the ad does the word marijuana or cannabis appear due to regulations concerning marketing of cannabis products. All the same, the ad placement is significant for being inside a professional sports stadium where attendees are accustomed to seeing the most common of brands. 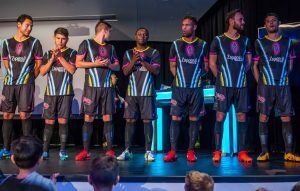 “We love Las Vegas, and we’re not embarrassed to support any business here,” said Brett Lashbrook, whose USL team wears jerseys sponsored by Zappos.com — which has played a major role in Las Vegas revitalization — and shorts branded with the logo of the local Plaza Hotel & Casino. Spotted Eagle also said Las Vegas Lights paraphernalia is not out of the question. Chris Spotted Eagle is a vice chairman of the tribe and along with the possibility of marijuana paraphernalia with the Las Vegas Lights logos emblazoned on the merchandise, they are also considering naming a new strain of marijuana after the team. This sort of advertising is about as far as the state of Nevada will permit Las Vegas dispensaries to market themselves, but if the intent is to eliminate a negative stigma surrounding marijuana and continuing work to normalize marijuana consumption within the US culture, then advertising within a professional sports stadium makes a lot of sense. Cashman Field is also home to a New York Mets Triple-A team, the Las Vegas 51s. Having an advertisement up for a Las Vegas marijuana dispensary in the same stadium as an MLB minor league team will probably draw some attention, although no reports of whether the advertisement will remain up during Las Vegas 51s games was disclosed. Marketing cannabis is one of the most controversial topics surrounding the legalization of cannabis. Many people are concerned that cannabis advertisements may appeal to children. States like Colorado have made it unlawful to manufacture cannabis infused edibles in the shape of animals or people so that children will not see them as ordinary candy. While marijuana remains a Schedule 1 substance, cannabis advocates will continue to have to struggle with the advertisement that are permitted for the alcohol and cigarette industry.